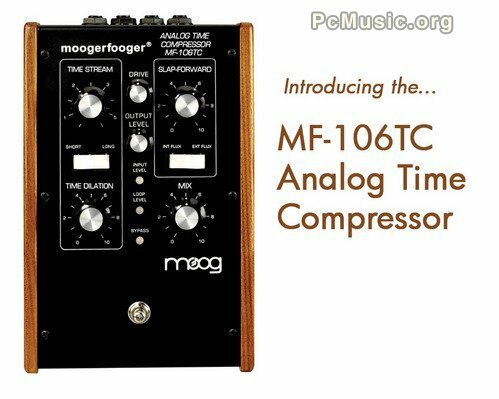 Moog unveils long awaited and much anticipated MF-106TC Analog Time Compressor. The history of invention and innovation is replete with instances of accidental successes: Chewing gum was a bad batch of tire rubber. Penicillin came from mold growing on abandoned plates of bacteria. And we all know about Benjamin Franklin and lightning rods. Our own musical mad scientists (who never fear failure and are constantly experimenting, tinkering and tweaking) have recently had their own kite-flying experience, and the result is the amazing and logic-defying MF-106TC, Analog Time Compressor. "We accidentally reversed the clock phasing in the time generation on our MF-104Z Analog Delay, and discovered that it can actually work in reverse, compressing the time stream instead of expanding it. Much to our amazement and delight we began hearing sounds up to 1000 milliseconds before we played them," said Amos Gaynes, Moog Temporal Engineer. Gaynes said that the Analog Time Compressor circuit on the MF-106TC can eliminate digital latency in real time, or sound like you're playing faster than you really are. The Analog Time Compressor's unique Slap-Forward delay effect sounds even better than Slap-Back, according to Gaynes. "The MF-106TC has hundreds of unique applications," said Moog Marketing Manager Chris Stack. "Used on the Pitch Preview output of our new Etherwave Plus Theremin, you not only hear your note before the audience does; you actually hear it before you play it." Consumer Product Safety Warning: Customers should not attempt to reverse the clock phasing of the time generation circuit on their MF-104Z delay to mimic the capabilities of the MF-106TC Analog Time Compressor. Without the factory-installed flux capacitor added, a standard MF-104Z will be seriously damaged." What's the day today ?